US Air Force photo by Senior Airman Derek SeifertF-22 Raptors stationed at Tyndall Air Force Base, Florida, that were evacuated to Wright-Patterson Air Force Base, Ohio, ahead of Hurricane Michael arrived at Langley Air Force Base, Virginia, Sunday, Oct. 14, 2018, where they will operate temporarily and continue to train to provide combat air power for America. The F-22 Raptor stealth fighter jets left behind at Tyndall Air Base, which was devastated by Hurricane Michael’s rampage across Florida, will be inspected by Lockheed Martin structural engineers. Initial reports indicated as many as 17 of the stealth jets, worth over $US1 billion, had been damaged, but newer assessments say the damage was much less severe, and the planes can likely be salvaged. Some of the F-22s made it out, but with the US’s top F-22 training grounds wiped nearly off the map, it’s unclear when the US’s top fighter will get back on track. The F-22 Raptor stealth fighter jets left behind at Tyndall Air Base when Hurricane Michael damaged or destroyed virtually every building on site will be visited by structural engineers from Lockheed Martin, the defence contractor tweeted. 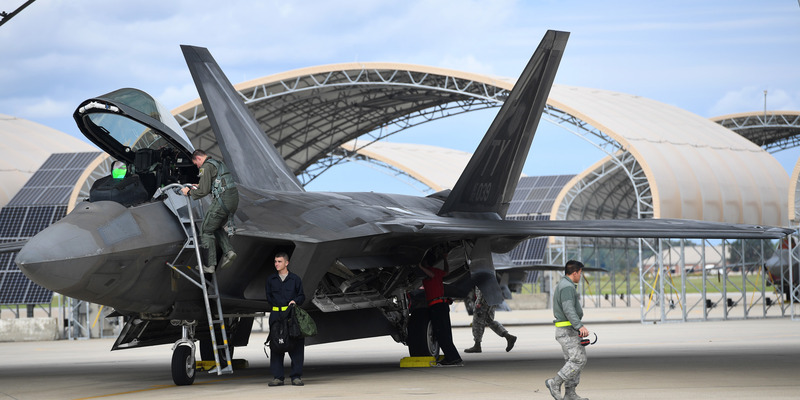 Tyndall Air Base serves as a critical training and maintenance ground for about 50 F-22s, or nearly a third of all of the world’s most capable air superiority jets near Panama City, Florida, Dallas News, who first reported the story, said. Hurricane Michael hit Tyndall with unexpected force and sooner than expected, and the Air Force left some of the jets, which cost in the hundreds of millions apeice, behind in the base’s most hardened hangars. But the storm proved historically powerful, and images of the aftermath show the hangars torn open. Initial assessments said that up to 17 of the planes had been destroyed, but top US Air Force officials later visited the base and said the damage wasn’t as bad as first thought. 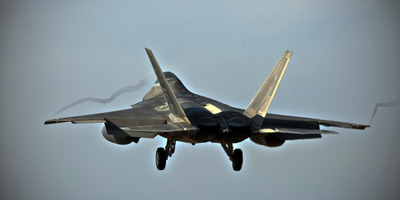 While the Air Force still won’t share how many F-22s were left behind, or how bad they were damaged by the storm, Defence Secretary Jim Mattis sounded hopeful on Tuesday. “I’m not ready to say it can all be fixed, but our initial review was perhaps more positive than I anticipated … in light of the amount of damage,” Mattis said, as the Air Force Times notes. US Air Force photo by Master Sgt. Eric BurksAn F-22 Raptor from the 1st Fighter Wing, Joint Base Langley-Eustis, Va., prepares to land at Royal Air Force Lakenheath, England, Oct. 5, 2018. The Air Force did manage to relocate a number of air-worthy F-22s before the storm, and they have returned to training stealth pilots in the world’s most capable combat plane. The limited run of F-22s, their stealth shaping and coating, and rare parts make repairing them a costly endeavour. But with Tyndall all but wiped off the map by Michael, it remains unclear when the US’s top fighter jet will get back on track.